Resembles Peregrine in outline and flight but slightly narrower based wings (male) give impression of longer tail. 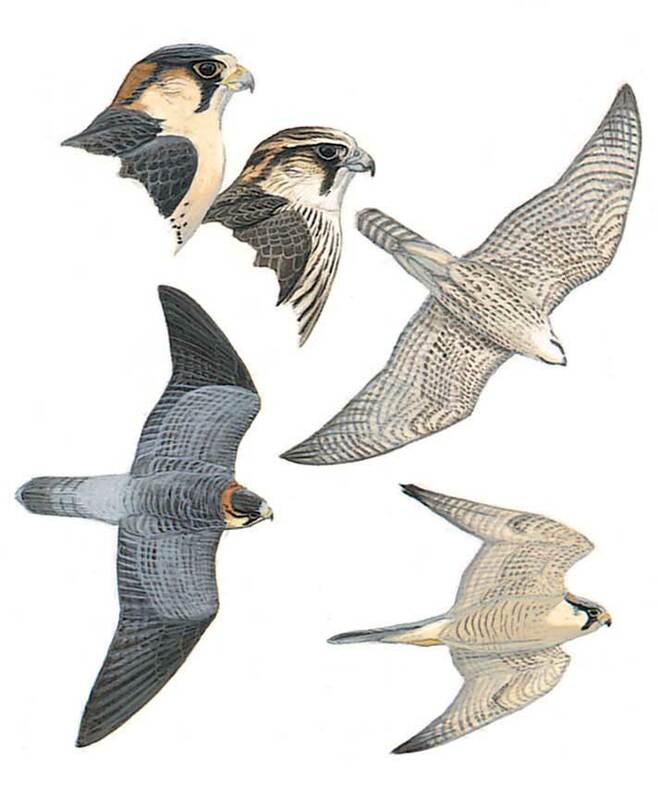 Adult separated from Peregrine by rufous nape and rear eyebrow, narrower moustache and larger pale cheek-patch, almost reaching eye; more creamy, less barred underparts,and often with dark ‘comma’ on greater primary coverts; upperparts paler blue-grey, more often with darker end to tail. Told from Lanner by dark top of head, lack of dark forehead-band and distinct eye-stripe, barred, not streaked, underparts and wing-coverts and narrower hand with more pointed wing-tip. Juvenile like Peregrine, but moustache narrower, cheek-patch larger and has tawny supercilium and rusty nape; rustier underparts with thinner, more restricted streaks.